Prime Minister Ahmed sold his watch for $175,000 during a similar fundraiser for the town of Ambo. 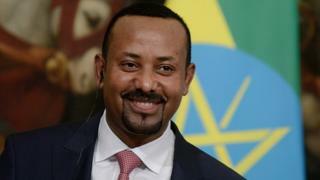 Ethiopian Prime Minister Abiy Ahmed will be hosting a fundraising dinner to help secure $1bn for infrastructure projects in the capital, Addis Ababa. Officials said tickets will be charged at more than $175,000 per person, but further details are unclear. The dinner hopes to boost foreign investment into one of Africa’s fastest growing economies. Since coming to power last year, Mr Ahmed has pushed for wide-scale economic reform in Ethiopia. A video released by the prime minister’s has set out plans for the redevelopment of Addis Ababa, including an expansion of green spaces and retail areas. Correspondents say Ethiopia likes to raise funds itself rather than rely heavily on foreign donors. Similar events have been arranged for economic investment and humanitarian relief. Prime Minister Ahmed sold his watch for $175,000 during a recent event for infrastructure development in Ambo, 100km (60 miles) west of Addis Ababa. About $14m was raised in total. Mr Ahmed came to power after three years of protest led by ethnic Oromos, who were demanding an end to what they considered their political and economic marginalisation. The prime minister, who is Oromo himself, has pushed through a series of significant reforms, making peace with neighbouring Eritrea and releasing the state’s tight grip on parts of the economy. His economic ambitions including a multibillion-dollar privatisation of Ethiopia’s telecoms, energy, shipping and sugar industries. A domestic stock exchange is set to launch in 2020. The reforms have attracted millions of dollars in foreign investment, especially from the Middle East. But Mr Abiy’s crackdown on corruption has drawn criticism from members of the country’s previous regime. In June 2018, he was targeted in bomb attack which killed two people at a rally in support of his government.